Let's leave downtown Albany for a while and go for a walk in the woods. My friends L&L took me for a ride through the countryside on the way to a restaurant they know. On the way, we stopped at the Huyck Preserve, a nature park and research station in the Helderberg Mountains west of Albany. 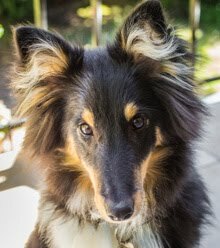 By the way, Huyck is a Dutch name and it rhymes with "hike." The visitor center at the park's entrance. The preserve offers twelve miles of trails for public hiking. We took a short walk along a trail that led from the visitor center to Rensselaerville Falls on the small creek that drains one of the park's lakes. We took our time and enjoyed the views. There were a bunch of cars in the parking lot, but we didn't see another person on the trail. The other hikers were probably a lot deeper into the park than we were. Some houses in the hamlet of Rensselaerville, just outside the park. Rensselaerville is both the name of the town (sometimes called a "township" in other states) and of the small hamlet where the park is. Rensselaerville is one of ten towns that, along with the cities of Albany, Cohoes, and Watervliet, make up Albany County. 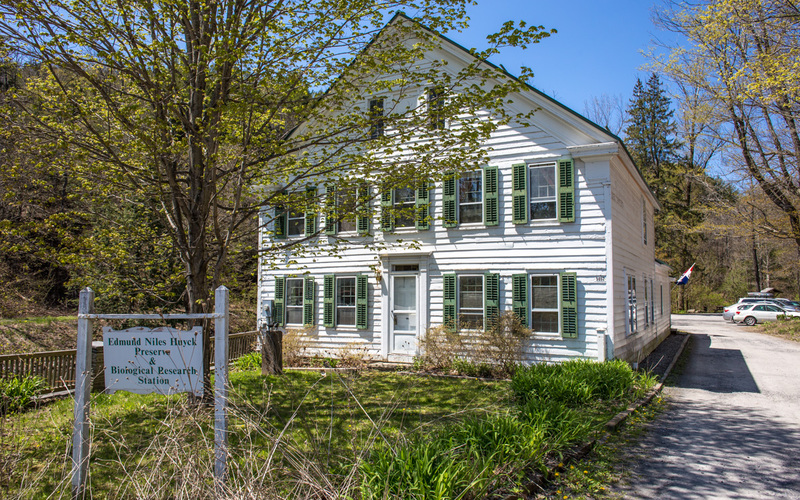 Rensselaervilles's town hall is in another hamlet called Medusa, about five miles south of the hamlet of Rensselaerville. 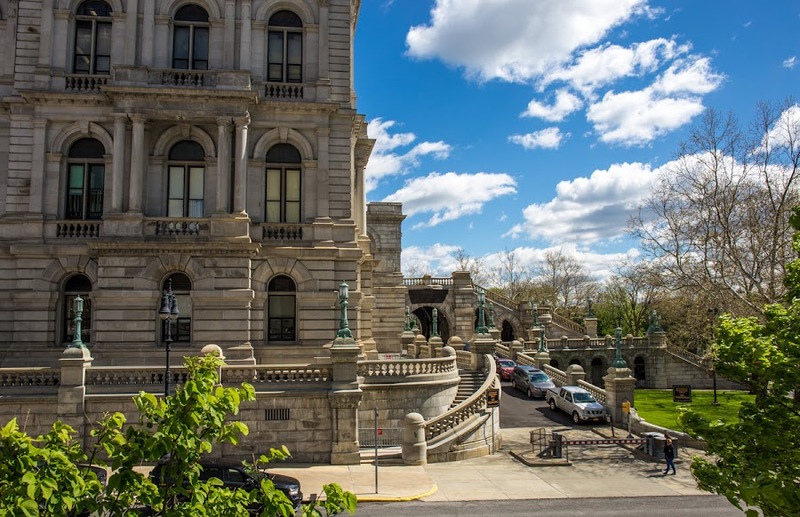 The current city hall in Albany was completed in 1883. 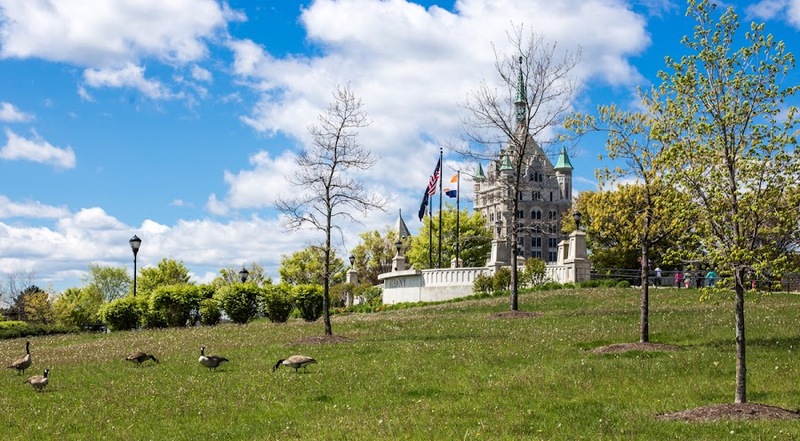 Designed by Henry Hobson Richardson, the building reflects his particular Romanesque style of architectural design. Richardson was one of the architects that worked on the state capitol, just across the street. Looking up at city hall. The tower contains a working 49-bell carillon. 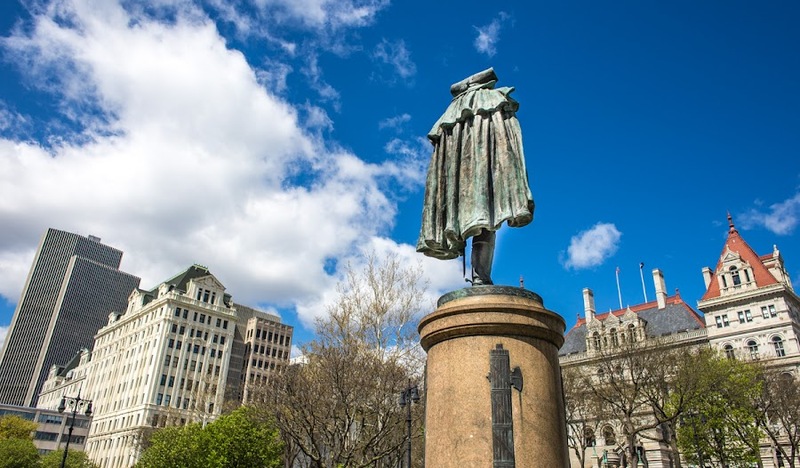 In front of city hall stands a statue of Philip Schuyler, an Albany native, Revolutionary War general, member of the New York State Assembly, then Senate, and ultimately elected to the United States Senate representing New York State. 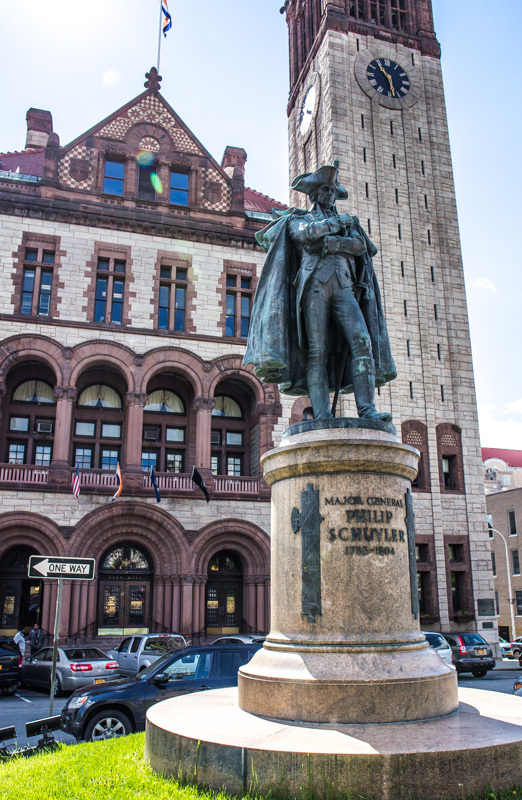 Major General Philip Schuyler and Albany City Hall. The statue was made by J. Massey Rhind in 1925, just over 120 years after Schuyler's death. The general's legacy includes his many homes, one being Schuyler Mansion in Albany, and an upstate county and a town that bear his name: Schuyler County in the Finger Lakes region where Watkins Glen is located, and Schuylerville, NY, just outside of Saratoga. The latter was the site of the Schuyler family's country estate. Schuyler's caped back is to City Hall; he's looking west toward the state capitol. 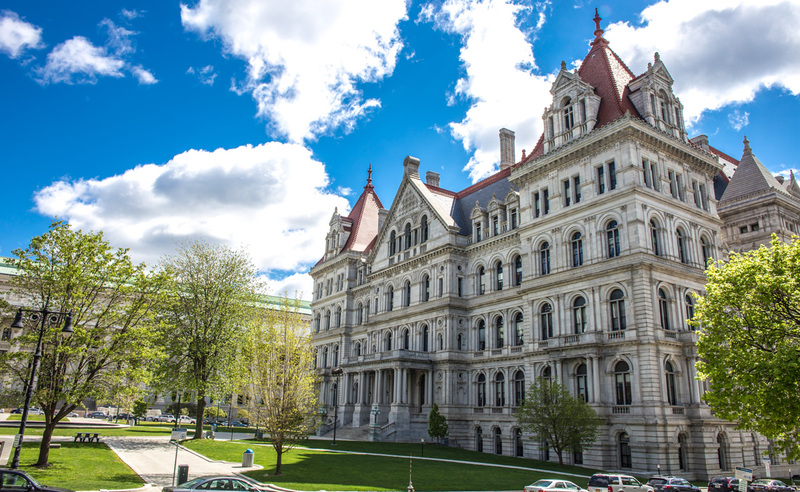 The grand stair on the east front is the ceremonial entrance to the New York State capitol. Although nobody uses it. Especially in these days of heightened security, the stair is closed altogether by barricades. It's a shame, but that's the way it is. The stair was added to the capitol after its construction to help stabilize the front facade which had started to shift downhill. In front of the capitol is an equestrian statue of General Philip Sheridan, a Civil War general born in Albany. Most people, I think, enter the capitol on the north or south sides. The north entrance is adjacent to one of the city's major bus corridors. That is where I would enter every day on my way to work in the plaza, crossing through the capitol, past the old-fashioned news stand, the shoe-shine stations, and the building's ground-floor cafeteria on my way to the plaza on the south side. The south entrance connects directly to the underground concourse of the Empire State Plaza and the Legislative Office Building. Under the monumental staircase is a porte-cochère, presumably where the governor and other dignitaries enter the building. The building, one of the few American state capitols without a dome, was completed in 1899 and declared a National Historic Landmark in 1979. It is thought that one of the building's primary architects (there were several over the thirty-two year construction period) was inspired by Paris' city hall building. An historical marker near the spot of the colonial- and revolutionary-era Fort Frederick. The exterior of the capitol was cleaned and restored between 2000 and 2014. Visitors can take guided tours of the building, including the Senate and Assembly chambers. I can't remember the last time I did that, but I did wander around inside in 2012 without taking the tour; some of my photos from then are here. If you've been watching my blog for a while, you've certainly seen this place already. My excuse for showing it again is that this time I was having fun playing with my new camera and the 24mm wide-angle lens. 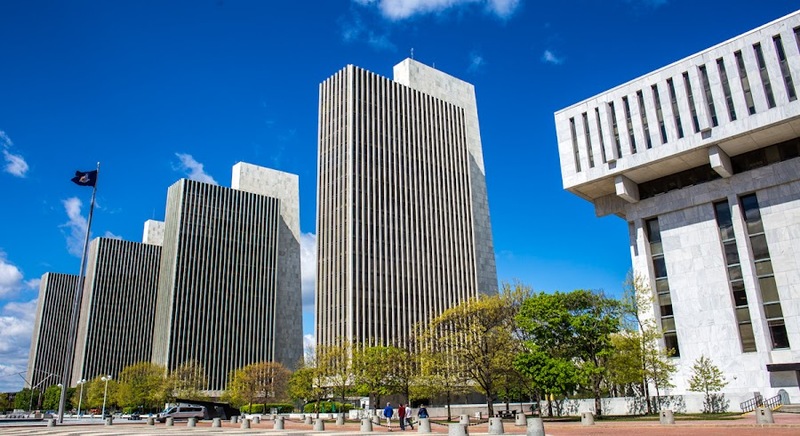 These buildings are state offices, built in the 1960s and '70s at the command of New York's governor Nelson Rockefeller. Looking south with the state capitol at my back. The plaza stretches for a quarter mile (400 meters) south from the capitol building. At the far end is the Cultural Education Center, home to the New York State Library, Archives, and Museum. Beneath the plaza is a broad underground corridor that connects all the buildings, including the Egg performing arts center (on the left in the photo) and a small convention hall. Not to mention several levels of parking garages. The four Agency Buildings. You can see part of the Legislative Office Building on the right. When I got my first full-time job out of high school, I worked in Agency Building 1 at the southern end of the plaza. I loved working in that place, being downtown, walking through the capitol building nearly every day on my way from the bus stop to the office where I worked. That was in the days before heightened security. I could walk right through the capitol complex with no worries. It's not like that any more. 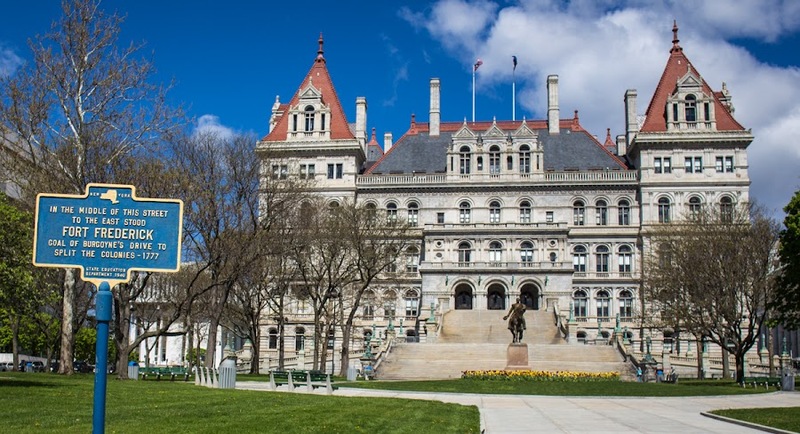 The park on the "back" side or "west front" of the New York State Capitol building is a lovely urban square. Government buildings surround it, including the monumental Corinthian colonnade of the State Education Building. 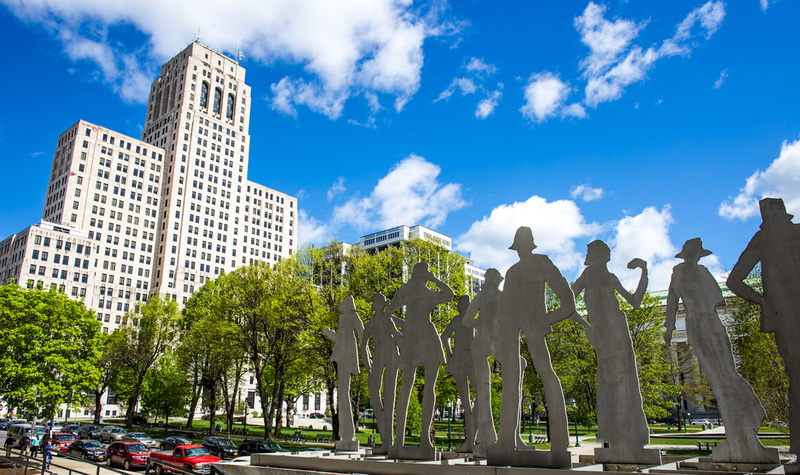 Every summer, food trucks park along the curbs and state employees line up for tasty lunches. I remember having my first taste of souvlaki and baklava from a Greek truck on the park back in the summer of 1978. A modern sculpture on the park's south side. The tall building is the Alfred E. Smith State Office Building. 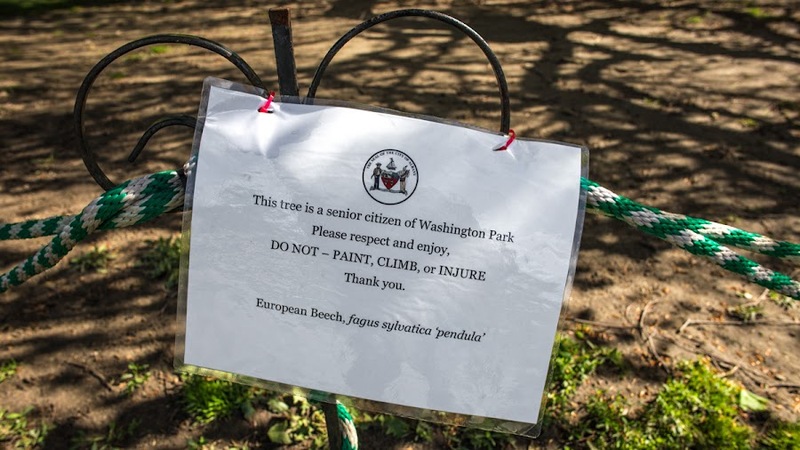 I have a vague memory of when the park was home to many stately elm trees and how they were dying from the Dutch Elm disease epidemic of the '60s and '70s. 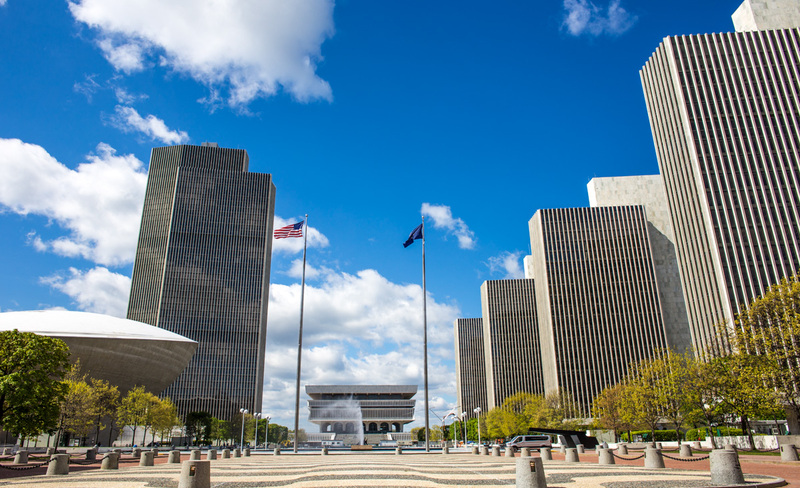 The Empire State Plaza complex to the south of the capitol was a huge construction site and downtown was a mess. That, too, is all but a memory now. The capitol building was renovated recently and the park has had a facelift. It's a nice place to hang out on a warm day. The west front of the capitol and, behind the trees, part of the colonnade of the Education Building in the background. I also remember visiting the NYS Museum inside the old Education Building as a school kid. The great hall was full of minerals and gems, dioramas of local Native American life before colonization, a life-sized woolly mammoth, and the skeleton of a whale suspended above it all. The museum moved out of the Education Building to its current home in the Cultural Education Center on the plaza in 1976. Although I didn't take a picture of it, a bronze life-sized statue of George Washington stands in the western end of the park, facing the capitol building. 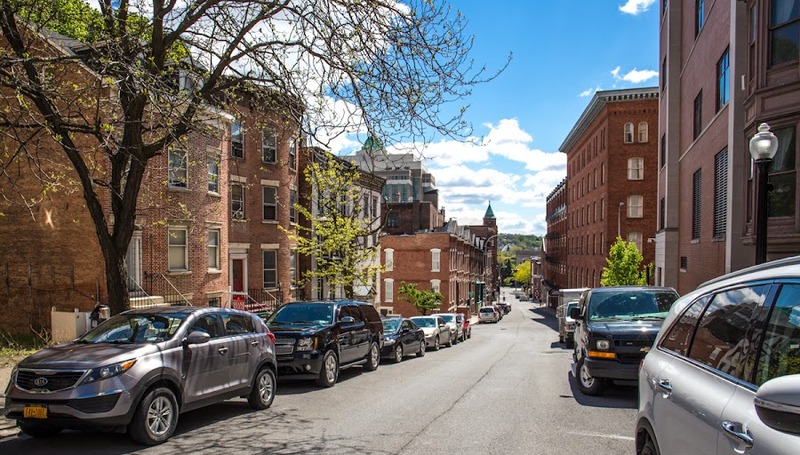 Here are a couple views of Columbia Street, a little downtown street that runs from the county courthouse down toward the river. 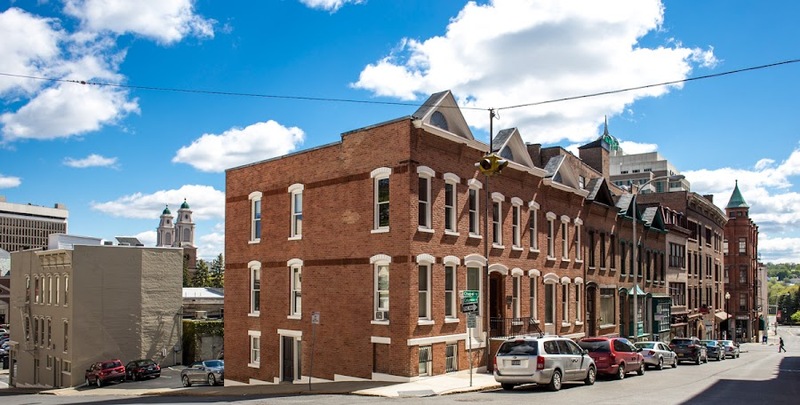 Many of the old townhouses on the street have been well maintained or restored, mostly used for offices or restaurants these days, I suspect. Looking east from near the top of Columbia Street down toward the Hudson River. One of the things that I did on this trip was buy a new camera. I've wanted to upgrade to a full-frame camera for a while now, so I did. 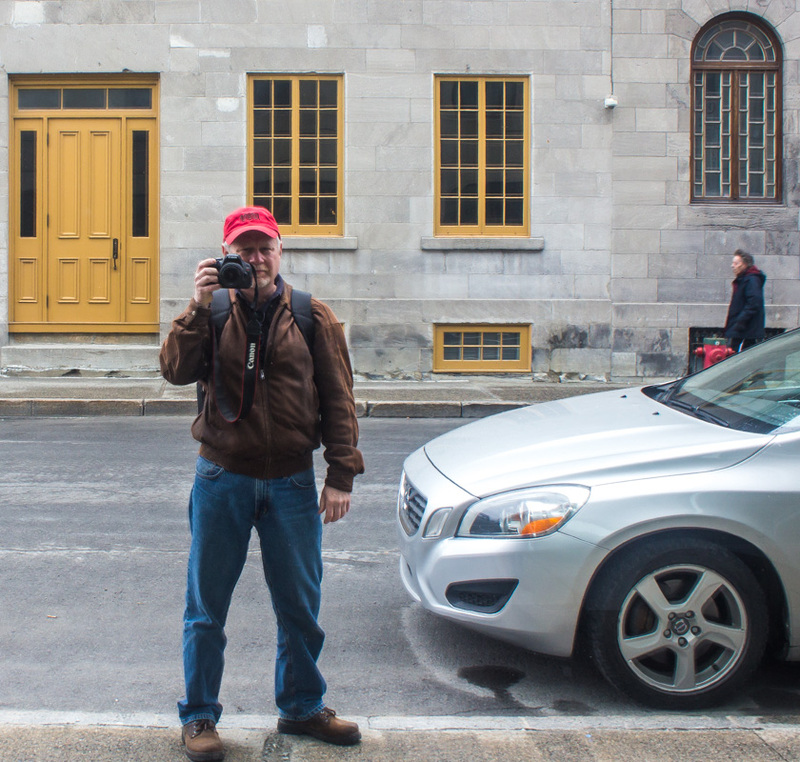 I took all of the photos from Montréal with the old camera, a Canon T3i. 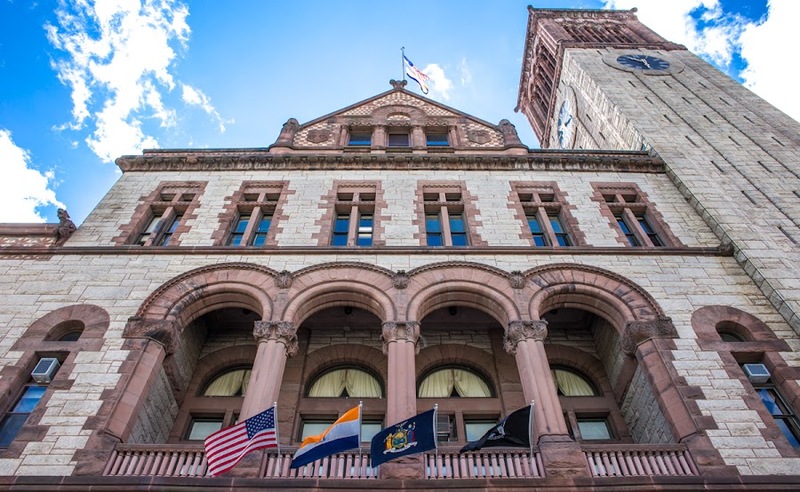 All the photos from the Albany portion of the trip were taken with the new camera, a Canon 6D. A neat row of townhouses at Columbia and Chapel. I also got myself a new lens: a fixed 24mm wide-angle. I had been using a 18-75mm zoom that came with the old camera, but it is not compatible with the 6D, so I thought I'd try a fixed wide-angle. Eventually I'll probably get a new wide zoom. My other lenses, the fixed 50mm, the 75-300mm zoom, and the 100mm macro are all compatible with the new camera. One day, if I'm lucky, I might spring for an even longer zoom. One day. I'm getting used to the new camera slowly. Some of the buttons are in different places from where they were on the old camera, and there are new functions that I'm trying to figure out. The full-frame format also subtly changes the way the lenses see things, so there's that to get used to as well. All cameras are different and it will take me some practice to get comfortable with the new one. Honk if you love geese! I saw this mating pair of Canada geese with their goslings on a lake next to my aunt's place uptown. We could see them from her living room window and every day we'd look to be sure they were there. 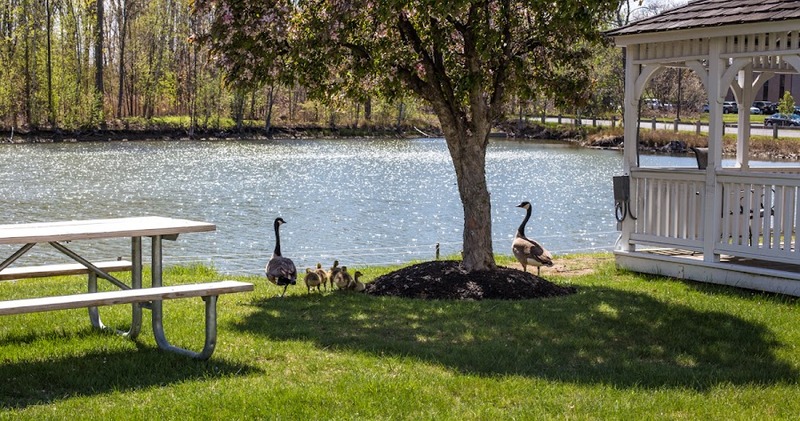 There are signs up around the property instructing people not to feed the geese, but they get fed a little, anyway. Above and below, the uptown geese and their five goslings feeding next to a small lake. 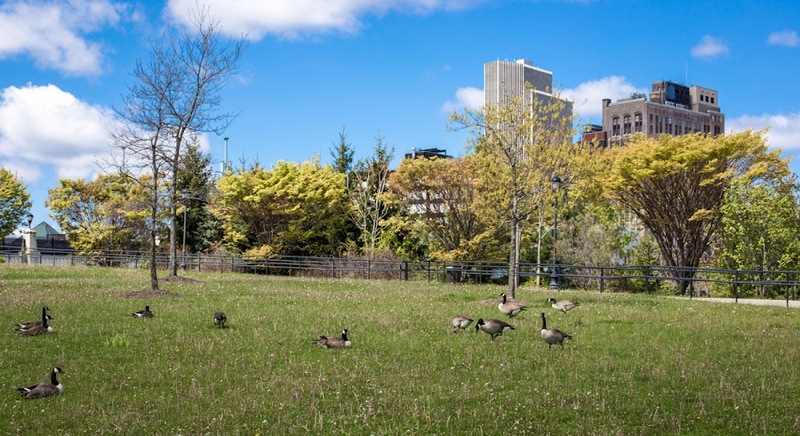 Downtown, at the Corning Preserve riverfront park, I saw a larger bunch of geese feeding on the grassy bank of the amphitheater that's built into the riverbank. There were no goslings in sight. The geese seemed indifferent to the pedestrians in the park. I made nearly a complete circle around them, staying on the paved walkways, of course. Above and below, the downtown geese feeding on the banks of the Hudson River. It's not quite Bilbo Baggins' party tree, but it did the trick. 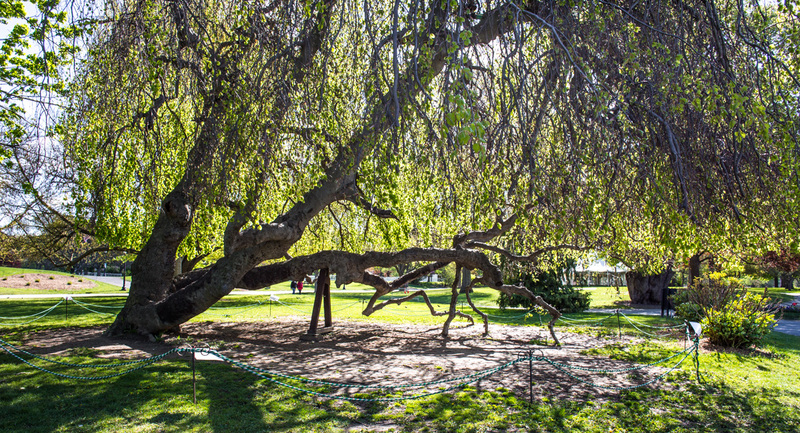 Four years ago, in May, Ken and I were married under this tree in Washington Park. It was a little fuller then; the weeping branches and leaves stretched all the way to the ground, and there was a picnic table nestled under the canopy. The park's groundskeepers have pruned it back quite a lot since. The picnic table is gone, and now there are ropes around the tree. The wedding tree today. It's been pruned back, and the picnic table is gone. I don't remember this little sign, either, but I'm glad it's there now. It's a European Beech! Who knew? Here's what the tree looked like back in May 2012. 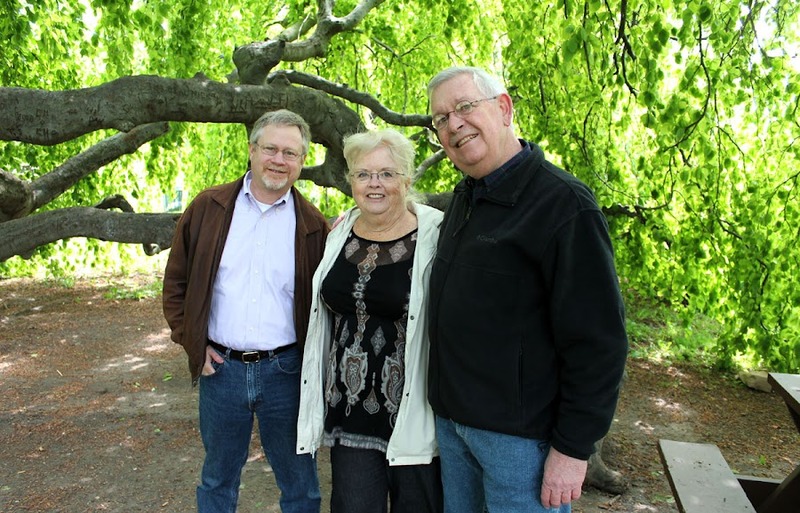 Me, Pat, and Ken, under the wedding tree in 2012. It was much more leafed out then. I got to see Pat, the woman who performed our ceremony, and her husband Richard, again on this trip. 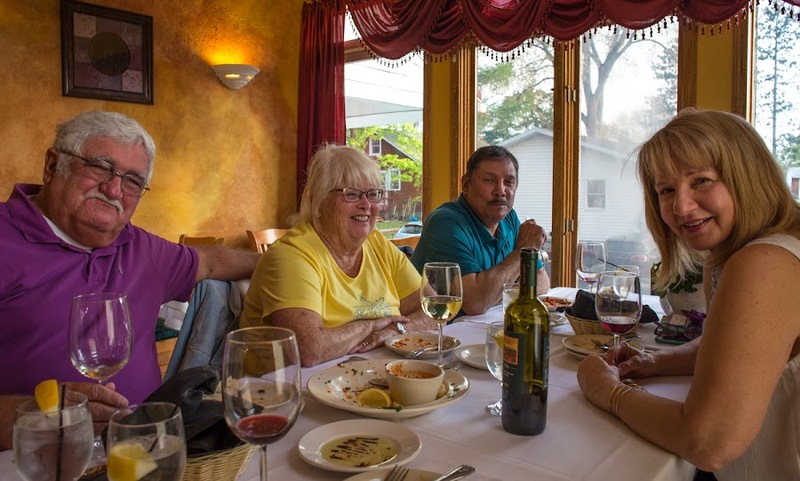 We got together with my friends L&L for dinner at a great little Italian restaurant called Café Calabria. We shared fried calamari (a recurring theme on this trip) and then I had chicken piccata with angel hair pasta for my main course. It was great to see Pat and Richard again! Richard and Pat on the left. My dear friends L&L on the right, who were at our ceremony in 2012. I saw a lot of geese in Albany this time. 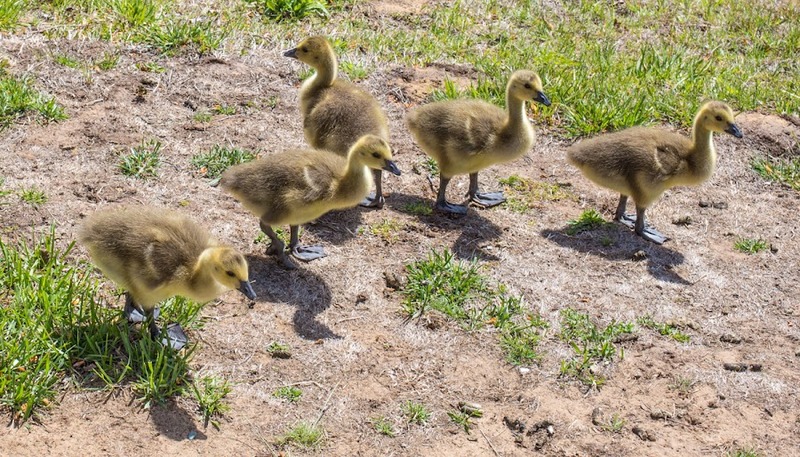 Some had goslings, others were just feeding or swimming. Like these. I believe all the geese I saw were Canada geese. Most of the geese I encountered were relatively unafraid of humans and were hanging out in public areas with people around. 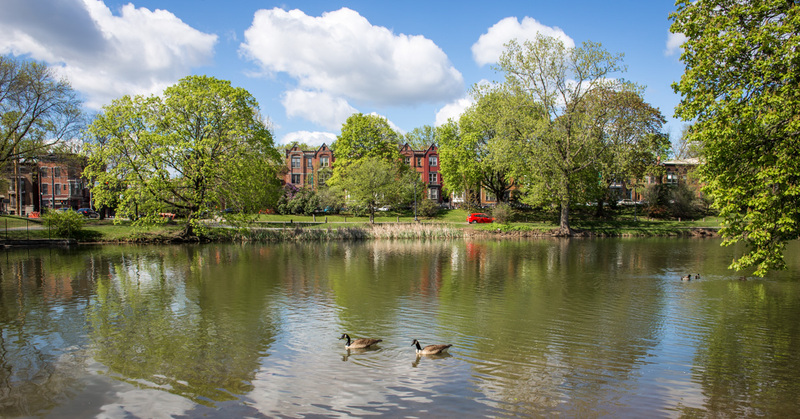 Canada geese on the lake with Madison Avenue and Albany's Park South neighborhood beyond. I have no idea how the populations of geese in the northeast have fluctuated over the years, but I don't remember seeing so many on the ground before. I've always seen Canada geese during their migrations, flying in that distinctive V-formation far overhead. And I've heard them: honk! honk! I rented a tiny Kia Rio Toyota Yaris* in Montréal for my drip down into New York. It was a great car, once I figured out how to open the gas cap and the rear hatch (I had to get the car manual out of the glove compartment for that). My only complaint was that it had Ontario plates instead of Québec plates. Oh well. *Ummm... it was to be a Kia Rio or similar. It was similar. I forgot about that. My little Kia Rio Toyota Yaris on the streets of Albany. 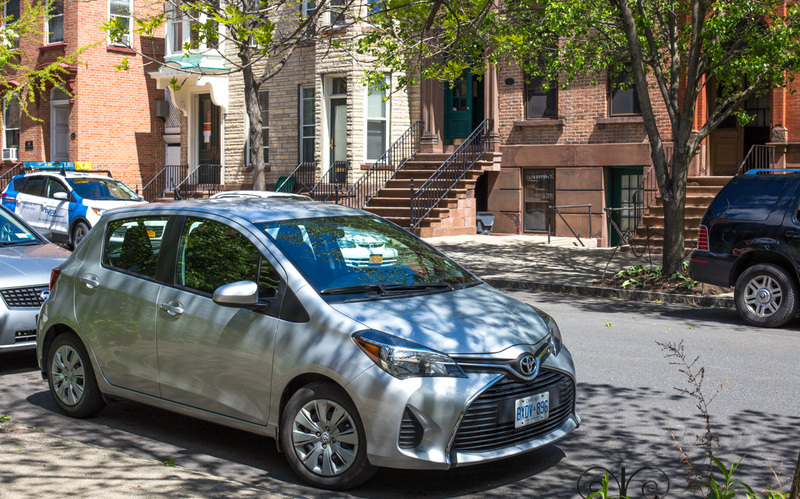 The rental agent told me that it was a city car, and if I planned to go long distances I should upgrade to something larger. I just nodded and took the little car anyway. It did fine on the four-hour drive and back. It's not like I was going across country or anything. The people at Enterprise were friendly and helpful and this was the second or third very good experience I've had with them. 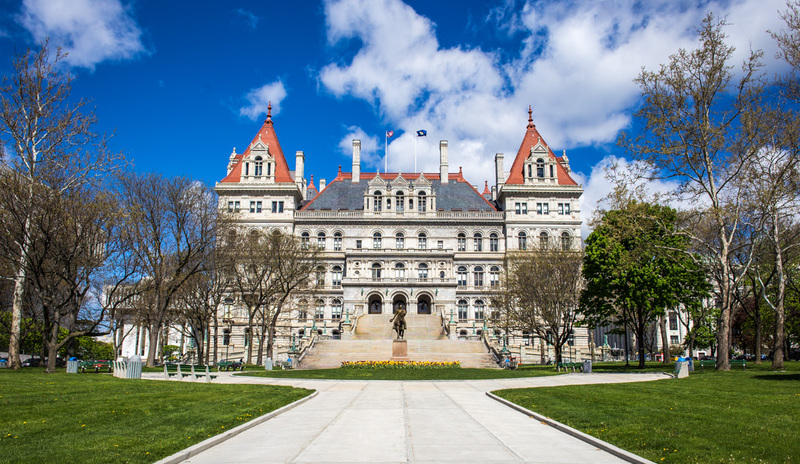 If you didn't know, Albany was founded as a Dutch settlement in 1609 when Henry Hudson sailed up the river that now bears his name as far as he could go. He met and traded with the local people, the Mohicans. 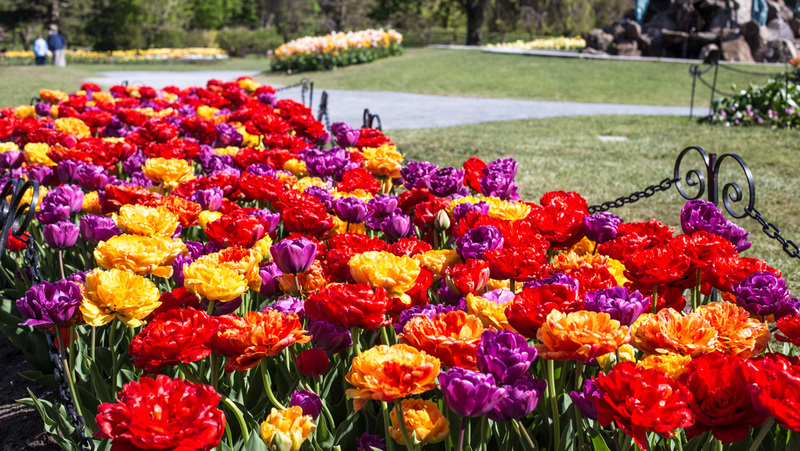 Because of the city's Dutch history, a springtime tulip festival is held every year in Washington Park. I didn't attend the festival, but I did get down to the park to see the blooms after the festival closed. Here are a few of the flower beds I saw. 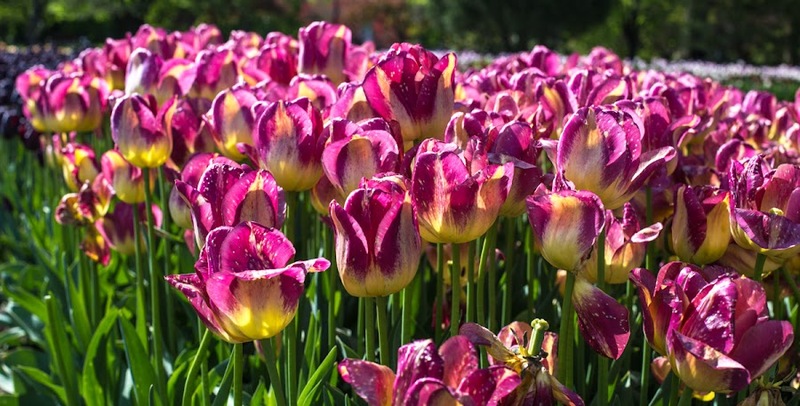 Each bed has a little sign that identifies the tulip variety. Most of the beds are concentrated in one area of the park. Curiously, they surround a statue of Moses parting the Red Sea striking the rock on Mount Horeb. Lordy Moses! What American town/city/suburb doesn't have a scene like this? A very wide street, multiple turning lanes for vehicular traffic, oodles of parking lots, a half dozen or so car dealerships, signage for days, extremely pedestrian-unfriendly walkways, and visually displeasing utility poles with wires strung along both sides of the corridor. Not a very pretty picture. Still, I wanted a shot of (what I think of as) the historic Westgate Shopping Center sign. It's been at this spot on Central Avenue in Albany as long as I can remember. Central Avenue (Route 5) in Albany, looking west. So I googled it. The shopping center opened in 1957 which makes it just a little older than me. The sign is considered a local landmark, but I don't see any mention of an official historic designation. I do remember shopping here many, many times over the years. The name hints at the plaza's location; at the western "gate" of the city on NYS Route 5, a 370-mile long route across the center of New York State from Albany to Buffalo and the western border with Pennsylvania on Lake Erie. From the north side of the street, still looking west. I think I'm going to skip around a little with this part of the trip. 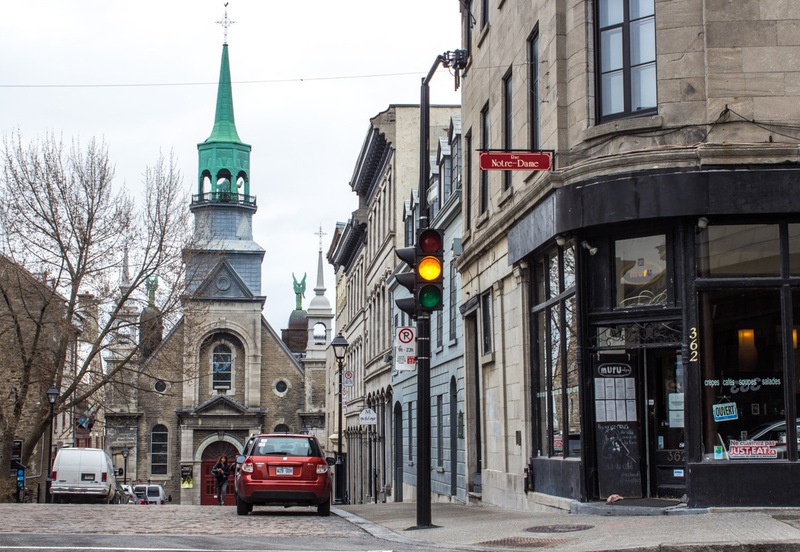 I was so predictably chronological with my photos from Montréal. Time to change it up a little. This is my home town on a bright, sunny day. I saw a version of this shot on a local television news station along with the station's logo and other stuff on the screen. So I wondered where they took it and started looking at a map. The next day, I drove across the river and found a boat launch and dock down on the water and figured that was the place. Albany's modest, but impressive, downtown skyline, looking south from the eastern bank of the Hudson River. There was a guy sitting in a lawn chair on the dock fishing. A couple were loading a small boat with their fishing gear. A cabin cruiser chugged by, going up river. It was a very peaceful scene and I took a bunch of pictures, without the boat. A closer look. The black bridge is a railroad drawbridge. The state capitol building is the one with the pointed red roofs. Gird yourself for a long string of photos from New York, mostly in and around this town. Before I get to the photos from my time in Upstate New York, I thought I'd show you what summer looks like here at home. We're in what I call "high summer" right now. Many warm days, less rain, and the summer green has settled in. A nice summer's day at home. Ahhhhh! 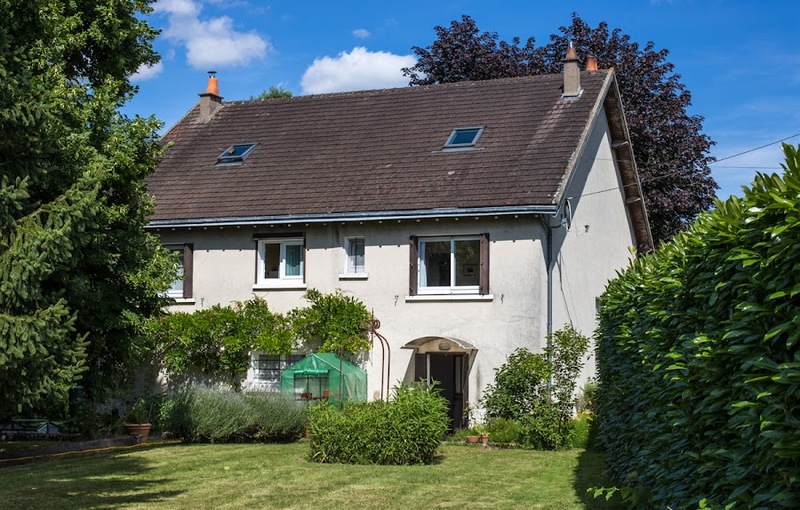 This is the back of our house. The wisteria is heavy and needs to be trimmed. I moved our greenhouse/tent from out by the garden to a spot against the house. We have basil, coriander, and catnip growing in there at the moment. Our lavender is starting to bloom. The grass is growing much more slowly than it did in the spring when it was constantly watered by rain, and parts of the lawn are getting their summer brown on now. 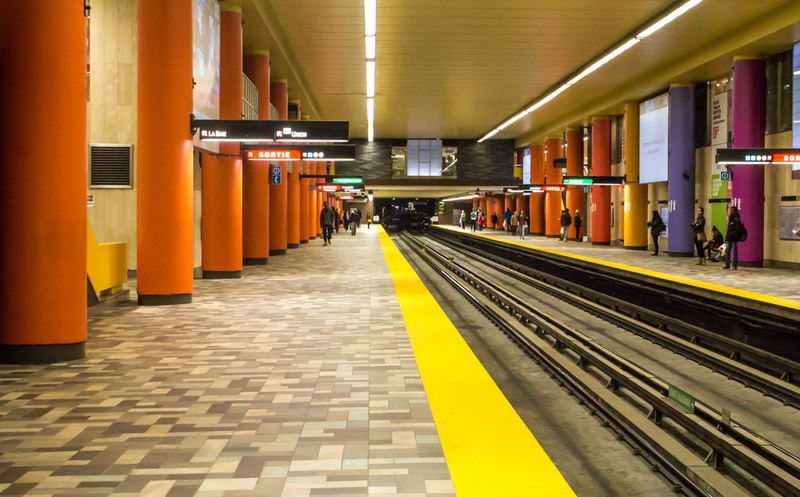 Here's my parting shot, on the platform of the McGill subway station in downtown Montréal. From here, I headed back to the hotel (at Berri-UQAM). I was meeting a fellow blogger and his husband for dinner later in the evening. In the meantime, I sat in the hotel bar, enjoyed a couple glasses of white wine, and caught up with emails and the news. On the eastbound platform at McGill Station. I met R. and S. at a place called the Saloon Bistro Bar on Sainte-Catherine. We started with a big plate of fried calamari to share, then I had what they called a Mec' Saloon (a cheeseburger with pickles and a "secret" sauce) and fries, my first burger of the trip. Delicious! Since it was Wednesday (a school night), we didn't stay out too late. The next morning I checked out of the hotel and picked up my rental car a couple blocks away. I drove up to the Plateau neighborhood to a bagel place that Ken and I went to in 2012. I enjoyed a sesame bagel with smoked salmon and cream cheese and coffee. Yum. I bought half a dozen bagels to go. After that, I drove out to a huge shopping mall in the suburbs where there is a Crate and Barrel store. I was in and out pretty quickly, stopped to fill the car's tank with gas (it wasn't full when I picked it up), then hit the road for my four-hour drive south to Albany. The border crossing was easy and soon I was passing through the Adirondacks. It was a nice day and a beautiful drive. Unfortunately, I wasn't able to stop on the interstate to take pictures; most of the rest stops were closed. This is a curious sculpture, outside a bank building not far from the gates of McGill University. 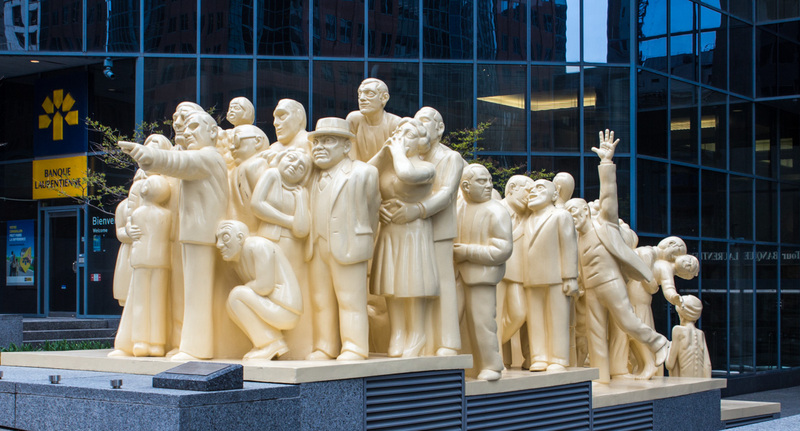 It's called "The Illuminated Crowd" by Raymond Mason. I won't go into the all the deep inner meaning of the piece; you can read about it here if you're interested. Current events are once again disheartening, be they terrorism or politics on either side of the Atlantic. Ugh. At least we're having summery weather once again and the vegetable garden is growing nicely. It attenuates the stress of world events. ...you've seen the mall. 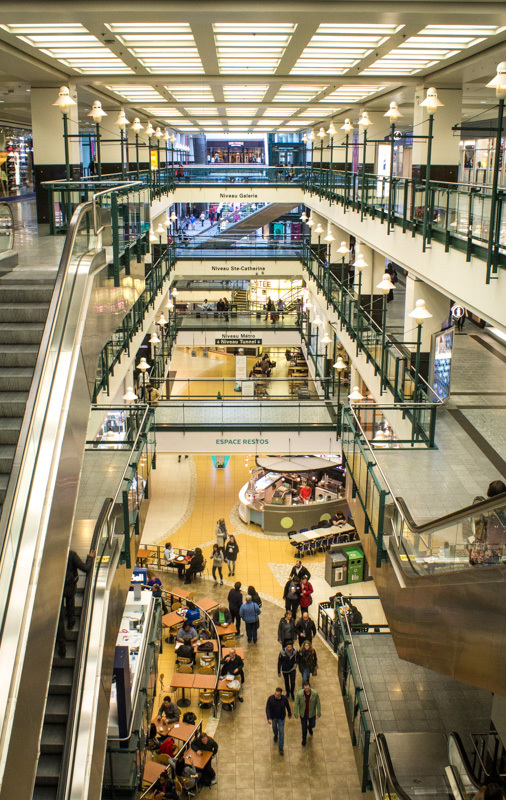 This is the Eaton shopping center in downtown Montréal. Nothing particularly spectacular, but there's something about this shot that I like. This atrium is connected to another multi-level shopping mall that was in the process of opening when I was there in May. I'm standing on the Gallery Level, one floor above street level (Ste.-Catherine), which is above the Métro Level and the Restaurant Level at the bottom. I can imagine these places buzzing with noon-time and evening shoppers, especially around the holidays. I wonder what they're like on weekends, though, when most of the office buildings that surround them are empty. I stopped into a humongous suburban shopping mall on my way out of Montréal the next day (there was a particular store that I wanted to go to) and it was as impressive in its horizontality as these are in their verticality. 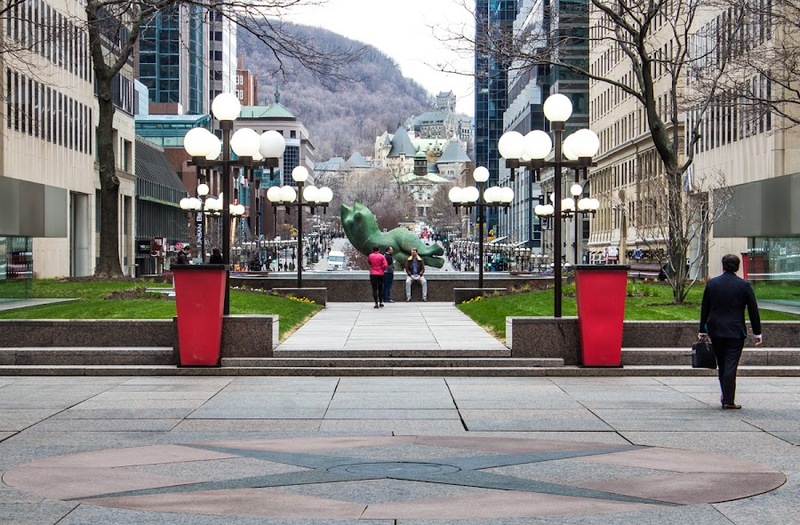 This is a view up the Avenue McGill College from the Place Ville Marie to the McGill University campus. Those buildings going up the side of the hill in the background are part of the university. I walked from here to the campus, but decided I was too beat to climb up the hill, so I headed back to the subway and my hotel. There's a compass built into the paving in the foreground. I'm facing northwest. But not before I wound my way through a new shopping center, which was still under construction right next to an older shopping center. All of it is connected underground to many offices, hotels, and the subway system, of course. Because: winter. 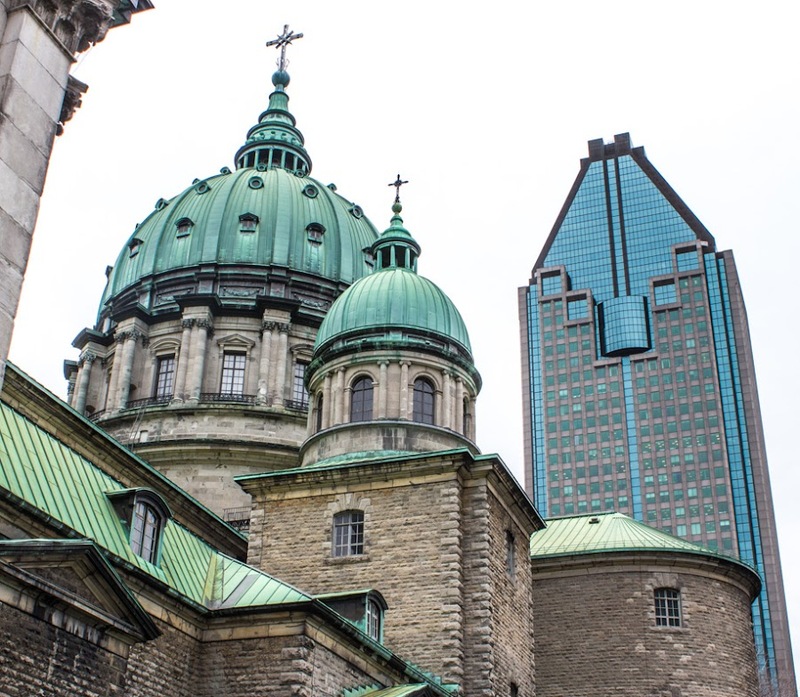 Here's the cathedral Marie-Reine-du-Monde from the outside. It's got an impressive dome. But these days it's dwarfed by the rising downtown skyline. Still, it makes for a nice contrast. The large central dome and one of two smaller domes. I left the cathedral and headed to the heart of downtown, the Place Ville Marie and it's iconic 47-story office tower, built in 1962. I hoped there would be an observation deck I could go up to for views from above. Indeed there is an observation deck, but it's new. The grand opening was scheduled for July. I missed out. 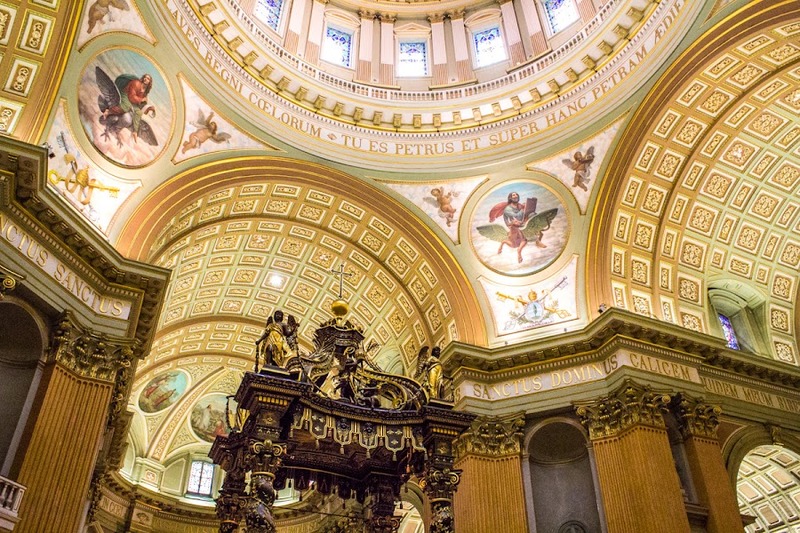 After my nap, I took the métro downtown to visit the cathedral of Marie-Reine-du-Monde (Mary, Queen of the World). 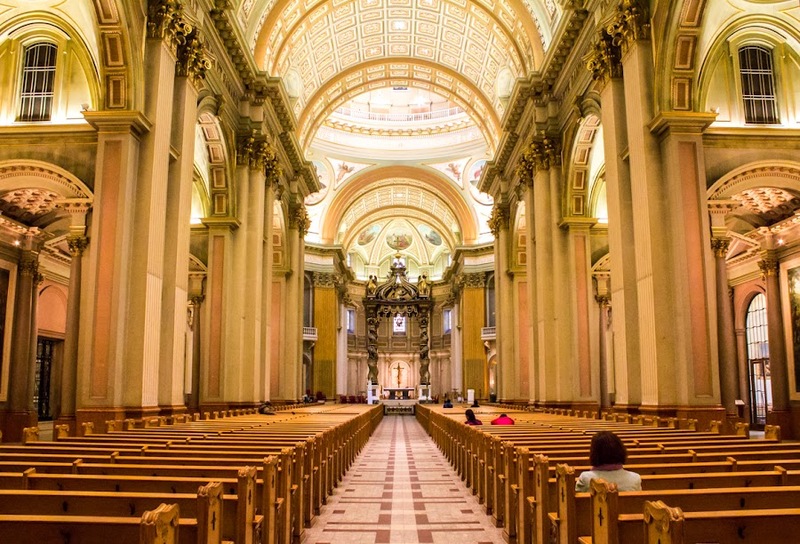 The cathedral is built in the renaissance style, similar to the neo-classical design of the Panthéon in Paris, but much newer. One hundred years separate the buildings' completion dates. Part of the central dome. You can see the top of the ciborium in this photo. There was no tour, no climbing, just an open church with a mix of tourists and worshipers. I wandered around inside and took some photos, then headed back out. I went, I saw, I left. The ciborium under the central dome. 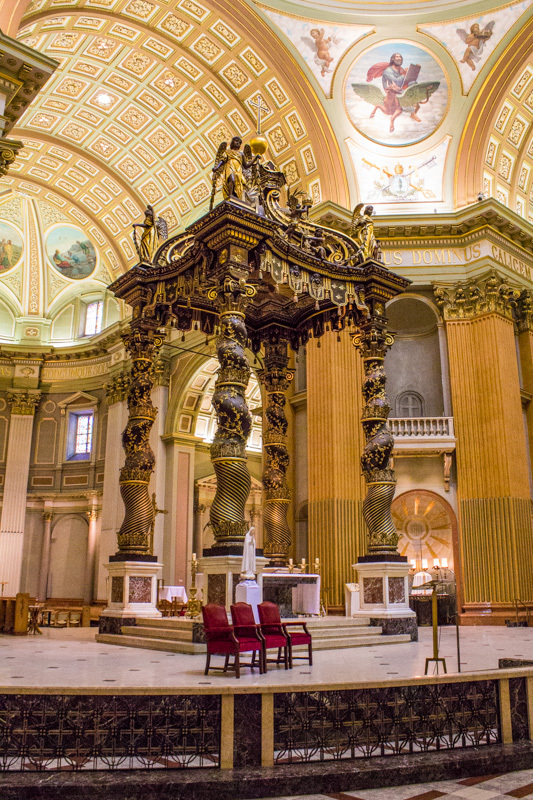 The ciborium, or canopy, over the altar was made in Rome and is, from what I read, a reproduction of the ciborium in Saint Peter's at the Vatican. I saw that one in 1981. Now I know why this one looked so familiar. The view up the central aisle in the nave. I think I posted this photo on Facebook the day I took it (over two months ago now). So for those of you who didn't see it, here you go. I was on the way back to my hotel room when I passed a storefront with mirrored glass. Your (not so) intrepid host. I flipped the photo so that I look "correct." When I got back to the hotel, I took a brief nap before venturing out for another, albeit shorter, walk. I had plans to meet up with some friends for dinner later that evening. I find it important when taking photos not just to look ahead, but to also stop and look behind me. Especially if I'm not planning to retrace my steps. If I hadn't at this point, I would have missed seeing this church down the hill toward the river. The traffic light was green as I was framing the shot and then it turned orange just as I pressed the shutter release. Maybe I should have taken another photo after the light turned red. In case you're wondering, between yawns, when I'll ever be done with these Montréal photos, fret not! The end is near. I liked the way the steeple of the church stands out against the new development behind. From what I can tell, the church (I don't know its name), or at least its steeple, was renovated as part of the larger construction project. 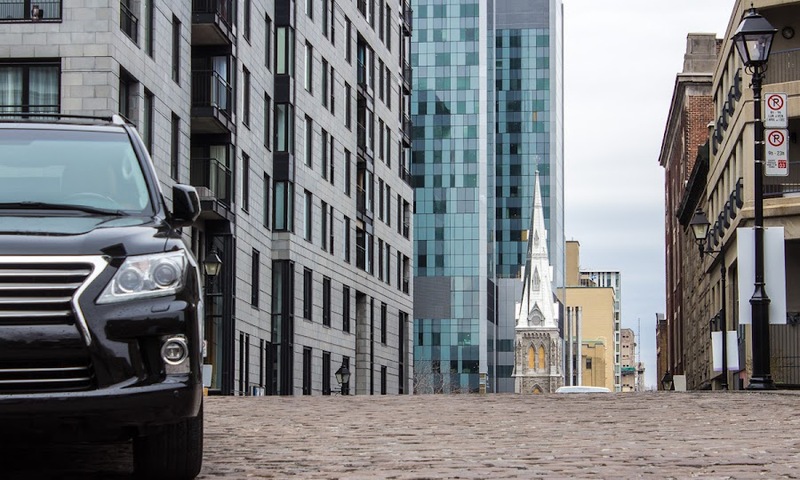 A luxury SUV on cobblestone streets. I planted the third row of green beans on Friday. The garden is now complete. It's now just a matter of keeping it watered, weeded, and tended for the next month or so. Then, harvest! I hope. Or, at least, I imagine it would be. It wasn't open when I walked by, but I like the idea: a champagne bar. 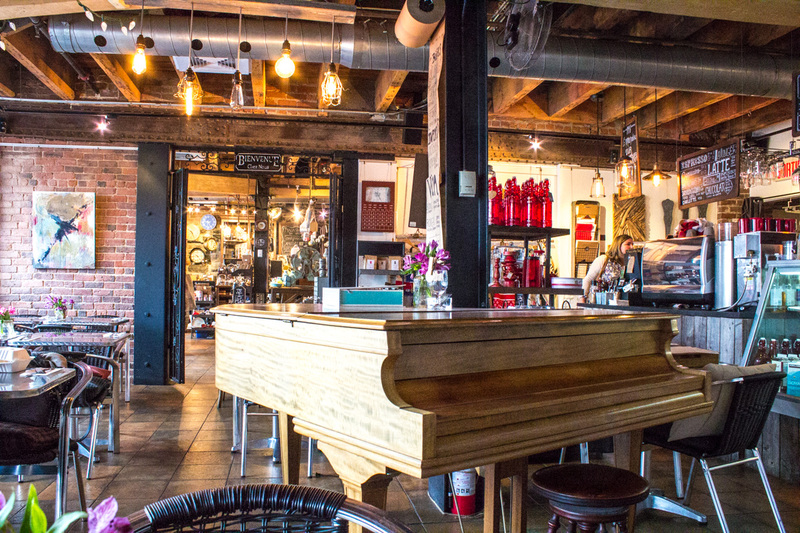 The place is also a restaurant. 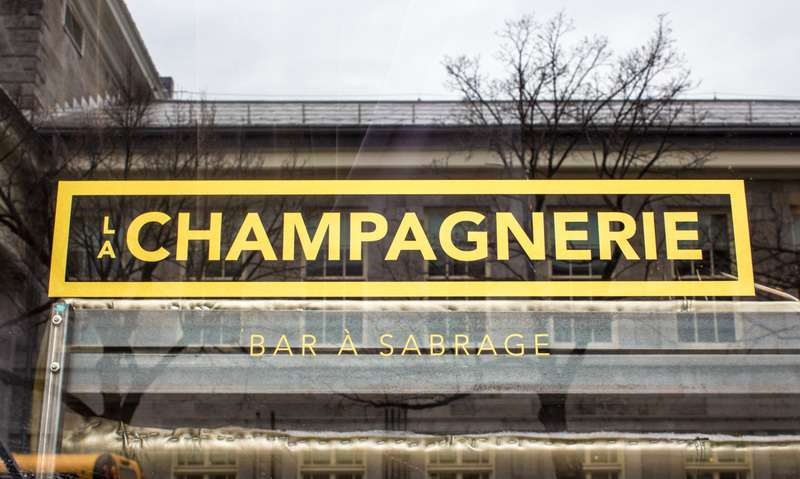 By the way, sabrage is the word for that way of opening a champagne bottle with a sword, sabre being the word for sword. I wonder if they actually do that? It's such a waste of good champagne since a lot of the wine ends up on the floor. I have never sabré-d a bottle of bubbly. A nice looking place opposite the Marché Bonsecours in Old Montréal. We're having a heat wave! Finally, summer is upon us. It's not too hot, but the sun is out and it feels great. A little warm for sleeping upstairs, but the fan is working fine and helps a lot. The place I found for lunch/brunch was called le Magasin Général (The General Store). I liked a lot of the stuff they had for sale, but resisted buying trinkets on my first day of vacation. Attached to the store was a little bistro. There were a few customers, but it was not full, and I got a table against the wall near the piano. The view from my table. The store is through the doors on the other side of the piano. If you click on the link above, you can take a look at their menu. I ordered an omelette au four (an oven-baked omelet) with bacon and cheddar cheese. 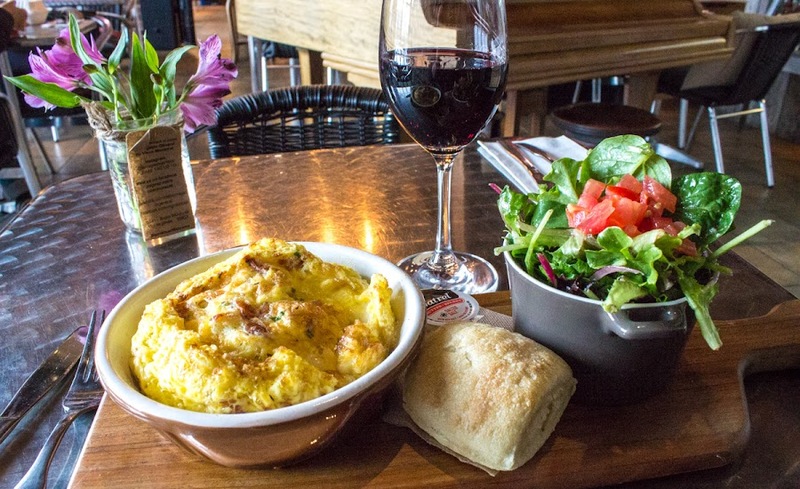 It resembled a soufflé and came with a delicious green salad and a piece of yummy bread. I also asked for a glass of wine, a California cabernet sauvignon. My bacon and cheddar oven-baked omelet. 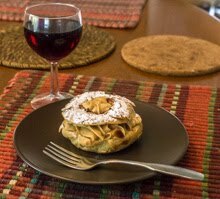 It was light and fluffy, almost like a soufflé. It was funny because it was around 10:00am and I wasn't sure if they would serve me wine at that hour. I asked the server, and he had to go check. When he came back, he said I could have wine, but only if I ordered food. I assured him that I was there to eat, and all was well. And it was all mighty tasty. 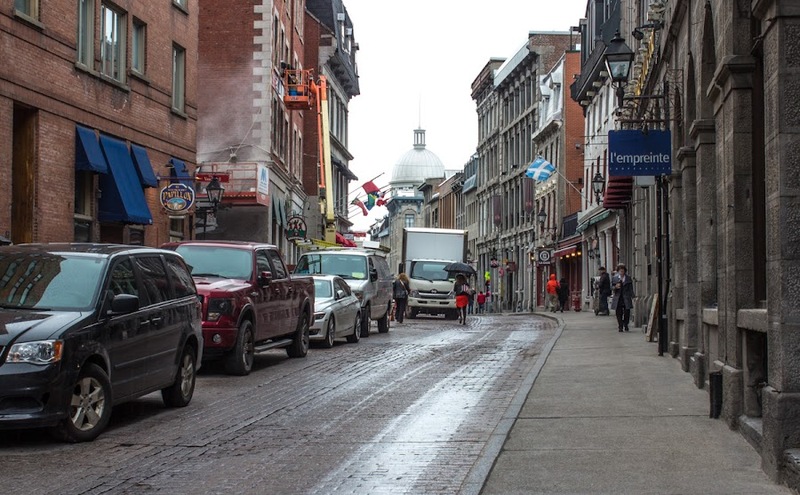 A shot of the rue St.-Paul on a drizzly morning in historic Old Montréal. I stopped into a t-shirt shop, but didn't find quite what I was looking for. Just prior, I had passed a nice trinket shop with a little bistro attached. The more I thought about it, the more I thought it would be a nice place for a bite to eat. So I made a quick loop back. You can see the dome of the Marché Bonsecours in the distance. Our weather here at home is improving again. We're expecting several sunny days with high temperatures approaching 80ºF. Oh, the garden will love that! This restaurant might have been a candidate for my late breakfast/early lunch, but it was not yet open. Still, I enjoyed the pun (I always enjoy a good pun, especially when I "get it" in French). 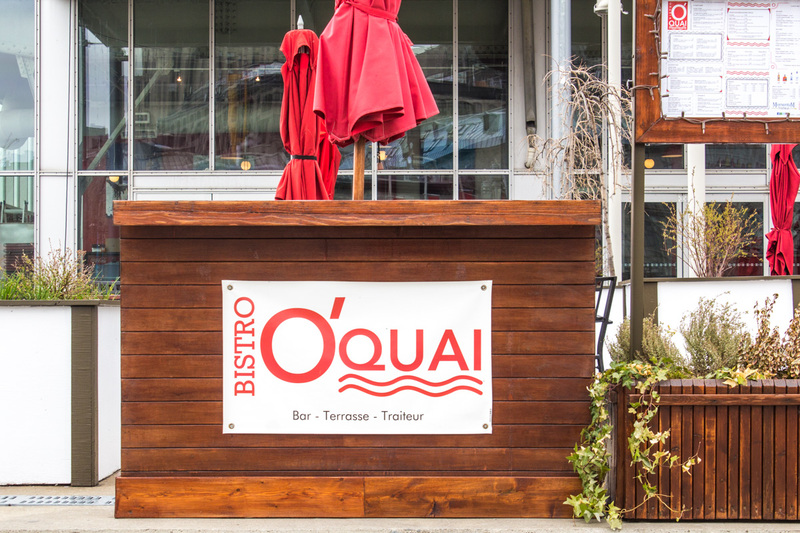 The restaurant is on the quay (another word for "wharf"), making it au quai in French. That rhymes with "okay" in English. Writing it with an "o" instead of the au makes it a clever pun. Bistro O'quai, bar, terrace café, and caterer. Okay, no O'quai for me. I had to move on. 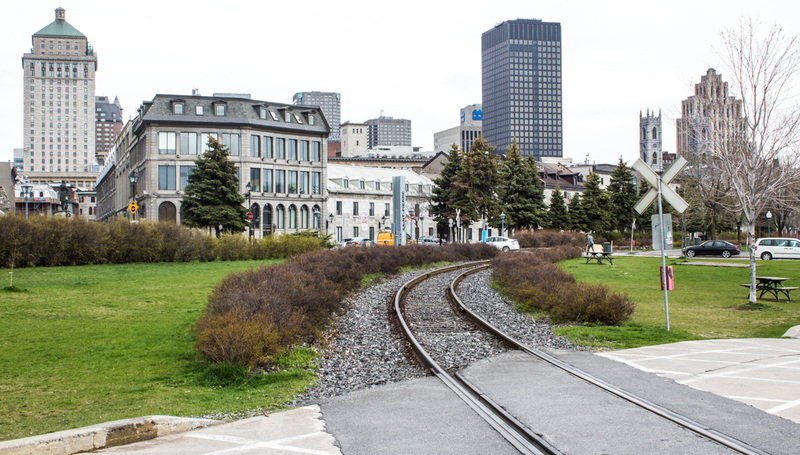 This single rail line connects the mills at the eastern end of the Lachine Canal to the wharves in the Old Port of Montréal. I'm assuming it doesn't get used much these days. Approaching Old Montréal from the waterfront. The morning continued to be chilly with an occasional rain shower. Nothing drenching, just drizzle mostly. I felt right at home. The waterfront was very quiet; it was still early (not quite 10:00am) on a weekday morning and the attractions were not open yet. But I wanted something to eat. Something to do with Shark Week?